When I identify a setup area based upon the structure of the market, one thing I absolutely love to see is a double failure pattern. The double failure pattern was discussed in a prior article (http://yourtradingcoach.com/trading-process-and-strategy/the-double-failure-pattern/) and involves two failed attempts to breach a significant structural area of the chart. Entry is on the failure of the second attempt. A second failure to do anything is often a good indication the market will do the opposite. Here are two rather different trades from the past week, both of which trigger into the trade through a double failure pattern on their lower timeframe chart. In the chart above we have price trending downwards till 00:08, at which time it then compresses into a loose symmetrical triangle leading into the Crude Oil Inventories report release at time 00:30 (candle A). This is quite normal behaviour for any market to congest prior to a key economic news release. Candle A shows that the market gapped higher on immediate release of the report but price was then driven back to previous levels. The area between B and C shows two further attempts to push higher (detail will be visible on the lower timeframe charts coming up shortly). A double failure of the two attempts to push above the news-impulse high, and against the higher timeframe downtrend, offers a nice entry short. As price was then pushed back from the highs at A, this high point becomes rather significant in my mind. It defines the battlefield that will determine whether price will rally in the direction of the initial gap opening, or fail and resume the earlier downtrend. Swing B is the first attempt to rally. It breaks A quiet easily but then stalls and fails. 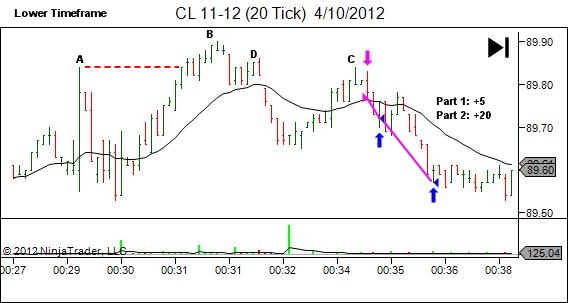 Swing C is a second attempt to push higher, this time on slightly reduced momentum and unable to breach A's high price. 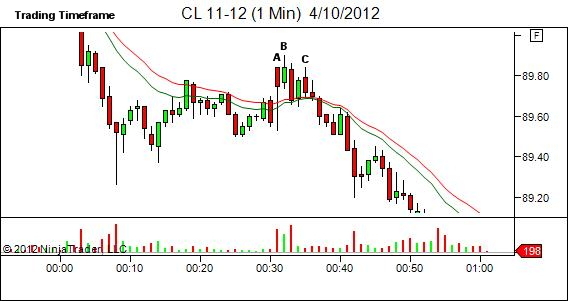 The failure at C offers an entry short. 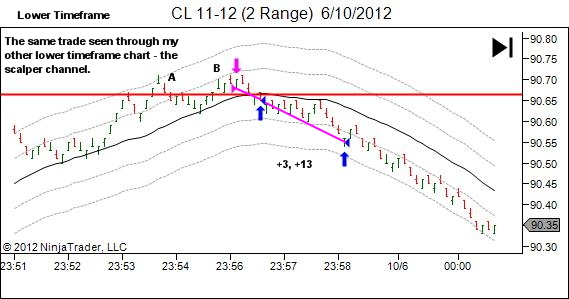 Targets were set at prior swing lows. On a smaller timescale you could also quite correctly consider B and D to offer a double-failure pattern. I love it in hindsight but wasn't 100% convinced when live. C offers a nice retest of this BD failure point. 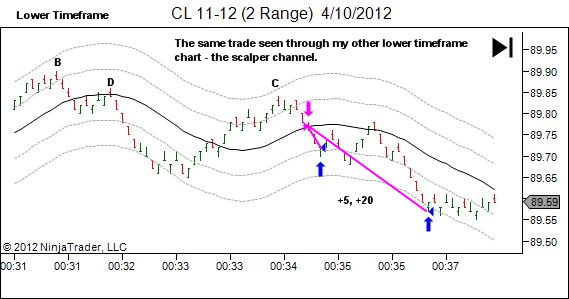 The following chart shows the same trade seen through my other lower timeframe chart- the scalper channel. We start here with a simple and proven TA concept – prior support becoming resistance. (The support/resistance level is shown as a line at 90.66, but is in fact an area between 90.66 and 90.81)). 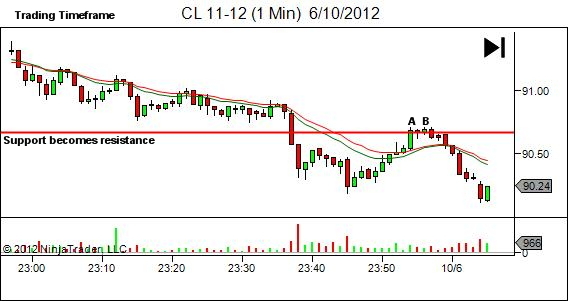 Price was trending down and broke support at time 23:36, rallying back to retest this level at around 23:55 (area A-B). 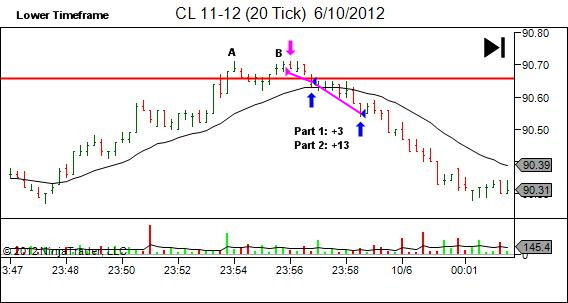 The chart below shows the lower timeframe perspective via a 20-tick chart. Areas A and B show two pushes into the resistance area, the second nicely stalling after a slower momentum push higher. A stall like this offers a great area for entry on a break below the stall region. Lots of profit was left on the table this time… but the exit was taken to maximise profits at an area of potential stall. The stall was minimal and there was no retrace… we accept what we've got and move on to the next trade! Whether used on your lower timeframe as a trigger for entry or exit, or on your trading timeframe for market bias, be sure to keep this general rule in mind… a second failure to do anything is often a good indication the market will do the opposite.